Turning handle diverts the first and last of the still run, step 7. 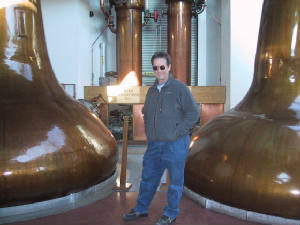 I recently had the opportunity to visit two whiskey distilleries in Scotland. Although I have been distilling alcohol myself for over 27 years, my interest has always been for fuel, not for drinking. I wanted to see for myself the traditional process of distilling whiskey, as it is quite interesting to see how the old-timers do it. One of the oldest, founded in 1798: Bell's Scotch Whiskey is made at Blair Athol Distillery in Pitlochry, Scotland. While it has a lot of history, the facilties are quite modern as it was re-furbished after WWII, and re-opened in 1949. The other claims it is the smallest Whiskey distillery in Scotland. Edradour Distillery, in the hills just above Pitlochry, has followed the exact same process of making whiskey for the past 150 year, making just 12 casks (600 liters) per week. Their production in one year is what the bigger distilleries like Bell's makes in one week. But, because the entire operation is done under one roof by just 3 guys, they have a much closer control of quality, essentially doing each batch by hand. nothing much has changed over the years at this distillery: in fact, they still have to go into the fermentation tank after the beer (wort) has been drained off and shovel out the spent grains manually. The actual process of making Scotch whiskey is quite simple, and is a good place to start if you want to understand how good high proof alcohol is made. They only use three ingrediants: Malted barley, water, and yeast. They don't use any enzymes, chemicals, additives, or anything artificial. Only hot steam is used for sterilizing the tanks and equipment, before making the next batch. Step 1: Malting. Sprout the barley for two days (soak it 10-12 hours, then drain off the water and keep at just above room temperature). The sprouts should be just at the stage where there are little white shoots about 3 cm. long. Then this is dried on big screens for a couple days, so it is dry enough for grinding. The process of sprouting the barley activates the naturally occuring enzymes inside the grain, converting the starch into a simple sugar, maltose. This is why they don't buy or use commercial enzymes. Step 2: Grinding. Grind the dried malt into a course meal (not fine enough to be used as flour, but more like what you would make hot cereal with. Step 3: Cooking. 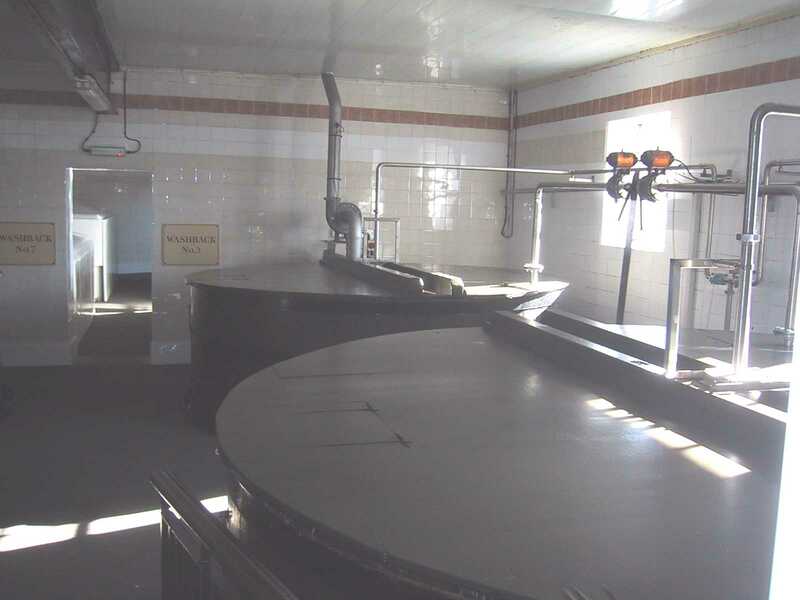 The ground cereal is mixed with water (Scottish spring water, in this case) in a big tank, shown just to the right of the malt grinder in this photo. Inside the tank is a big mechanical agitator to keep the stuff stirred up while cooking. This is just a bigger version of how you would make oatmeal mush. You don't want it to stick to the bottom while it is cooking, so you have to keep it stirred. This process takes about 4 or 5 hours, because of the size of the cooking tank (it takes a long time to get 3,500 gallons of mash up to cooking temperature). If you were making a small amount of mash on your kitchen stove, it would only take 20 or 30 minutes. Back in 1979, when I was traveling to various universities around California, teaching people how to build stills and make their own ethanol, I sold dozen or the following book, now out of print. This is a fairly compete manual for farm scale production of ethanol fuel: the fuel distillers "Bible", really. It is now out of print, so here it is in Adobe format, the Alcohol Fuel Production Manual. The author is S. W. Matthewson. Hmmmm, smells good in here! Good information on grinding dry corn for ethanol production can by found on my Making your own E85 page. 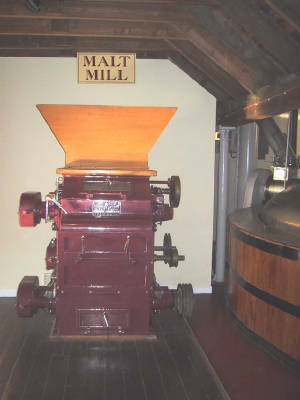 This mill grinds the malted barley into grist. To the right of the mill is a fermentation tank. Step 4. Separating the wort. The first cooking of the mash is with a thin liquid, really, as they don't like to deal with the solids during the cooking phase. Just as when you are cooking oatmeal, and it sticks to the bottom of the pan, the barley-meal would stick to the cooker tank during the process of boiling the fermented mash to produce the steam in the whiskey still. The fermentation tank has a coarse sieve screen at the bottom. After the initial cooking (or "sugaring" as it is called--refering to the starch conversion and dissolving of the barley malt sugars), the liquid is drained off into a fermentation tank. The remaining wet grains are hauled away and used for livestock feed. Step5. Fermenting. 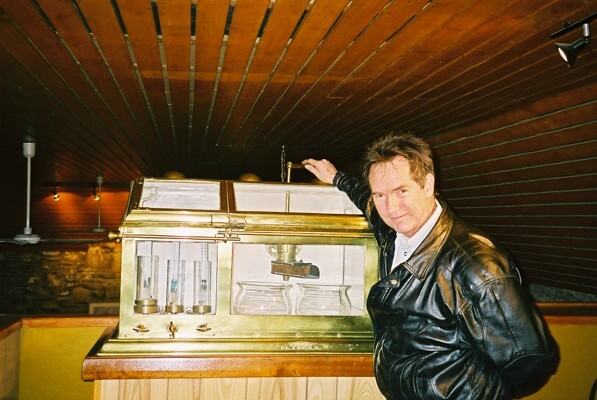 Small whiskey distilleries generally use new yeast for each new batch, rather than cultivationg their own. Big firms (like the Heineken Brewery in Amsterday) have their own laboratries for cultivatinng the strain of yeast they use. Once the yeast is added to the liquid wort, the fermentation is completed in 2 to 3 days, as it is held above room temperature, usually about 95 Degrees F.
Step 6, Distilling. The stills you see here are very simple batch or pot stills, except that they are huge. They are quite beautiful, hand-wrought out of copper sheeting, over 200 years ago. They do not produce high proof at all. The first distillation makes 40 proof alcohol (20% concentration). This is the still you see on the left in the above photo. Then this liquid is run through the second still, producing 80 proof (40% vol.). So actually, during each run, they are only removing a little more than one half of the water content: not efficient at all, really, but hey, this is how they have done it for the past 400 years. The distillate is cooled in pipe coils running inside tanks of running cold water from a nearby creek. Step 7: decanting and casking. The distilled product is first measured for proof, and then poured into oak casks. The very first runoff from the second distillation is not used. The reason is that it may have undesirable esthers as these boil off before ethanol starts to boil. Also, the last part of the distillation run is not used, as the proof starts to drop below 80 proof. Only the middle part of the distillation run is used for drinking whiskey. This selection process is done at a glassed-in valve box called a "Proof Safe". It takes a bit of skill on the distillers part to do this properly, but it eliminates the need for carbon filtering, which is not used in making Scotch whiskey. The 80 proof whiskey is put into the oak casks, and these go into a warehouse where they sit to age for 10 years. During this ten years, about 1/4 of the alcohol is lost to evaporation. The Scots call this the "Angel's share". The aging mellows the taste and picks up a bit of the wood flavour and colour. Step 8. Blending. Various whiskies from different distilleries are usually blended to produce a more uniform taste, as the literature says, but I suspect it mainly allows distilleries to make more money by blending cheaper products with small amounts of the more expensive ones. Bell's is normally sold as a blend: only perhaps 2% of their product is sold as a more expensive unblended product. Edradour whiskey is mainly sold as an unblended single malt whiskey. It may be hard to find on the world market, as only a small amount is made each year. Single malt refers to the fact that only one type of malted grain was used to make the mash. Scotch whiskey is not made from blends, although types of whiskey may be made from wheat instead of barley. Why whiskey yeast is different than bread yeast. When you are making bread, the main purpose of the yeast is producing the CO2 that makes the bread rise, so it bakes more evenly. If you are making whiskey, you want to use real whiskey yeast, which doesn't produce as much poisonous fusel oils. It is the ideal yeast to use if you are fermenting wheat or barley. here is the link for more information, and for buying whiskey yeast. One caution: if you want to ferment feedstocks like corn, which will yield more than 8.5% alcohol beer, than you should use Turbo-yeast. Here is a link for your Turbo-yeast. They sell temperature tolerant, high alcohol yeast to consumers and distilleries. Corn Fuel Alcohol distilleries ferment very fast at 35-38C to 17% by volume with this yeast. http://www.distillery-yeast.com/ Another link for buying brewing yeast in large quantities isYou can order smaller quanties of all kinds of useful chemicals from http://www.usbcorporation.com A friend has been using Cellulase and Brewser's Yeast from them and also distase of malt. You'll need to sign a usage form (stating you won't use their products for human consumption and releasing them from liabilities associated with the misuse of their stuff). Contact one of their sales reps to have the forms faxed to you. Once you are set to order with them, the products arrive in just a couple days. This is the other enzyme link mentioned in the above paragraph. this is an on-line discussion/newsgroup on making and using your own alcohol fuel. Subscribe for free, to access archives.